The Shepherd Centre would like to extend its sincere condolences to the family and friends of Robert ‘Bob’ Truscott, a long-standing supporter. 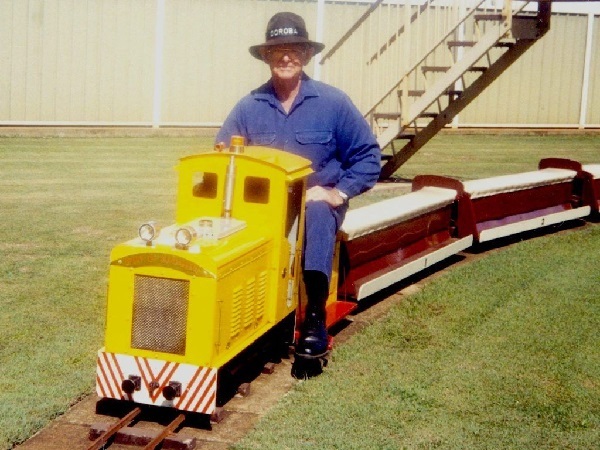 Bob was known as the ‘train man’ by residents of his hometown Bundaberg; the self taught welder established a miniature railway in his front yard and named it ‘Doroba Railway’, although locals referred to it as ‘Truscott’s Trains’. Bob built a second miniature railway – a real working model steam train – and welcomed the community to visit, take a ride and enjoy some tea and cake after. For almost 30 years Trustcott Trains was favourite amongst young children who were thrilled at the chance to ride the locomotive. Bob was the recipient of many awards in recognition of his tireless work for his community. He was Citizen of the Year in Woongarra Shire in 1989, recieved a Seniors Award from the state government in 1995, a Centenary Medal in 2001 with his wife Dorothy and, also with Dorothy, an Order of Australia Medal in 2008. Bob’s connection to, and support of, The Shepherd Centre was through his grandson, Scott, who was diagnosed with profound hearing loss at birth. Through a correspondence course with The Shepherd Centre, Scott was able to develop his speech, listening and language skills, giving him the opportunity to reach his full potential. A locomotive shaped money box collected donations for The Shepherd Centre in lieu of flowers.